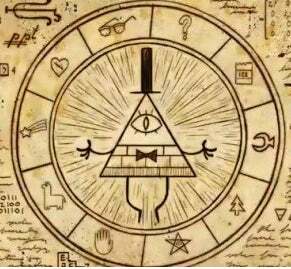 How about that Gravity Falls-episode, huh? Just caught up on this beautiful, wonderful, amazing television show. I hadn't seen "The Land Before Swine" or part 1 of the season finale, "Dreamscaperers", and man. This show only gets better. Every episode delivers suspense, hilarity and another piece in this wonderful story, as well as spending time with flawed characters of all kinds banding together for their friends. It's... it's a thing of beauty. And it might be my favorite television show ever. Brilliantly animated, the show looks like nothing else ever - everything in it is just stunning. And the writing... my god. There are a couple of writers out there - Neil Gaiman, Aaron Sorkin and Bryan Fuller, for instance - that just make my jaw drop and think about giving up my wish to be a screenwriter because they're so damn good. Alex Hirsch is definitely a part of that list now.